LIMA, May 2 2010 (IPS) - The Olmos megaproject, which will divert water from the Huancabamba River through a trans-Andean tunnel to a desert area along Peru’s northern coast, is being touted as a catalyst for development, but disputes are heating up over land, crops and water. The goal of moving water from the Atlantic side of the continental divide to the Pacific side for the Olmos hydroelectric and irrigation plan in the northwestern region of Lamayeque has been a dream for the past 80 years – a seemingly endless story fits and starts. 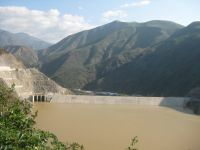 In the original plan, there were three phases: diverting the Huancabamba River, which comes from the mountains of the Piura region, through a tunnel under the Andes Mountains; the construction of a hydroelectric complex; and the irrigation of 110,000 hectares in the coastal valley of Olmos. In March 2006, the Brazilian firm Odebrecht won the bid to build the diversion. In its first stage it would move some 400 million cubic metres of water – of the 750 million initially projected. Odebrecht also was put in charge of the irrigation project, estimated at more than 200 million dollars. But the hydroelectric plans are on hold. In the opinion of the Olmos Special Project’s management, it is the cure-all for Peru. The nearly 20-kilometre tunnel under the mountains has been highlighted recently on U.S. television’s Discovery Channel. According to its reports, some 2.5 million cubic metres of water will reach the country’s poorest farmers if the expansion of the initial plan is carried out. What is certain is that the 38,000 hectares to be irrigated in the first phase do not belong to small or even medium farms. They are lands that the Alberto Fujimori government (1990-2000) expropriated from the peasant community of Olmos, and will be put up for sale in lots of at least 1,000 hectares at a base price of 4,100 dollars each. “But the peasant farmers are waiting expectantly anyway, because they think that they will be able to irrigate their land. That is going to generate conflict,” Luis Carbajal, secretary of the non-governmental Defence Committee of Lambayeque Megaprojects, told Tierramérica. “This is not designed for small properties. The idea is to generate permanent units of production so that the farmers have employment, elevate their standard of living, and move out of the forgotten peasant class,” he told Tierramérica. In addition, he said, 5,500 hectares of land belonging to farmers in the old valley of Olmos will be irrigated, who would pay Odebrecht for it. According to the Defence Committee’s Carbajal, such an approach will lead to a land invasion. And it is likely that the small farmers will begin to cut down native forests of carob, zapote, huarango and hualtaco, to replace them with exportable le crops, such as asparagus or artichokes. Carbajal noted that the project had included a hydroelectric component to make use of the waterfall. But because that phase was suspended, 80 million cubic metres of water of the 400 million needed for the entire area will go to waste, he said. The Lambayeque Defence Committee filed a complaint against the regional government with the Comptroller General’s office for allegedly short-valuing the project. Rejected there, the complaint went to the Attorney General’s Office, where it is still being reviewed. The controversy even extended to the Cabinet of President Alan García. Economy Minister Mercedes Aráoz argued about the Odebrecht budget for irrigation with Prime Minister Javier Velásquez Quesquén, who thought it should be improved. Former economy minister Cecilia Blume explained to Tierramérica that the government provided 70 million dollars to Lambayeque for the diversion project, and served as guarantor for the remaining 330 million dollars needed for the investment. That sum should be generated by the sale of government-owned lands in Olmos. However, the value of the land, according to Blume, depends on the irrigation. If they can only count on having water half the day, as Odebrecht proposed, the land prices will fall, and with it, the funds to pay for the diversion. As the result of an Apr. 13 meeting between the government and Odebrecht, according to an announcement by Aráoz, the company improved its proposal. “Before, even with all the revenues, the irrigation project was only going to provide 74 million dollars to the people in 200 years. Today we can say there will be 98 million in 40 years, which means the payment of 35 percent of the diversion in that period,” she told the local media.